Interrobang completes 12oz. packaging for Switchback Brewing Co.
Over the past 11 months, Interrobang has continued our work with Switchback Brewing Co., largely focused on new packaging as the brewery moves to 12oz. bottles and 6-pack carriers for its full line of beers. The flagship Switchback Ale will be the first release in the new bottles and carriers, with Dooley's Belated Porter following in the next few weeks. 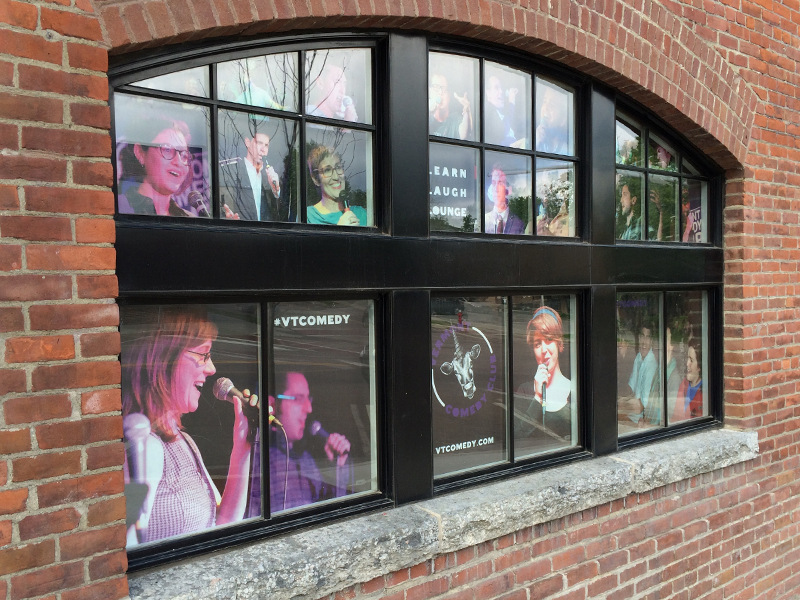 Interrobang has continued its collaboration with Nathan Hartswick and Natalie Miller, designing, producing [and helping to install] large scale, full-color graphics in the windows of the future home of the Vermont Comedy Club. The installation corresponds with the start of this year's Green Mountain Comedy Festival, and construction for the Club. Located at 101 Main Street - otherwise known as the Armory building in Burlington, VT, the VCC will be connected to the recently completed Hilton Garden Inn. Vermont Comedy Club, LLC (VCC) is Vermont’s premier comedy booking agency. Founded by the husband and wife team of Nathan Hartswick and Natalie Miller, VCC has been the driving force in building a market for live comedy in Vermont for five years. VCC produces standup and improv comedy events using local, regional and national talent, and offers comedy education through its DBA, Spark Arts. 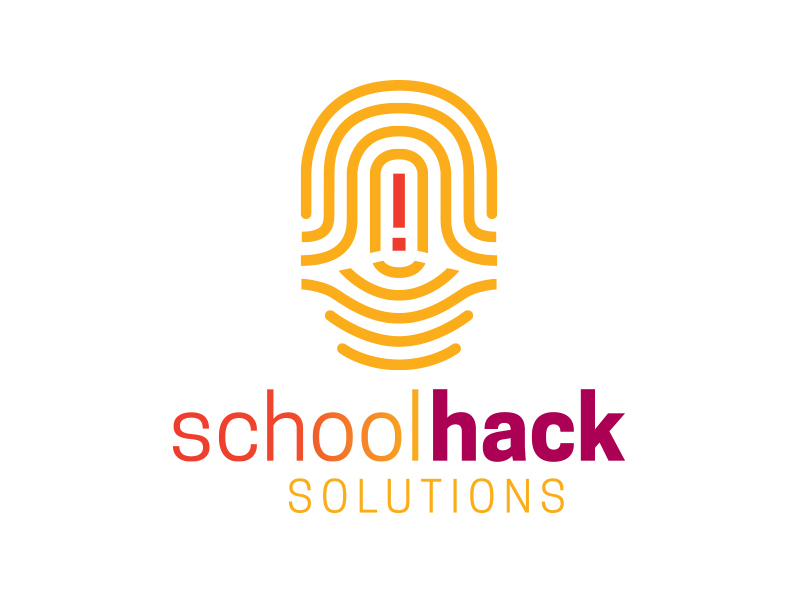 Lisa Sylvester has developed the logo, brand identity, marketing materials and website for SchoolHack Solutions. The Vermont-based company builds software to provide authentic personalized learning for all students. SchoolHack Solutions envisions a new era of educational excellence where learning is meaningful, contagious, and always relevant. Interrobang has again donated the design and production of the 2015 VBSR Spring Conference brochure and other branded materials for the conference. They are also a conference underwriter. Interrobang has completed a series of event materials for New York-based Madison Performance Group and AbbVie Pharmaceutical’s Summit All Star Awards Program that will held in Oahu, Hawaii from May 12 - 17 2015. Mark developed the identity for the trip, the Program of Events, onsite signage, name badges for the 13 different franchise groups, and almost 250 one-off, personalized banners that will hang in Pearl Harbor, on approach to the USS Missouri battleship during the All Star Recognition Dinner. Madison Performance Group is a cross-disciplinary performance marketing agency focused on driving measurable results for their client’s workforce, sales channels and customer groups. Interrobang has completed the design of the 22oz. bottle labels, tap handles, and promotional graphics for Switchback Brewing Co.’s Citra-Pils Keller Bier, the brewery’s second lager. Generic Specials case boxes were also designed as part of the project. The specific contents and packing date are added via an inkjet printer when the cases are sealed. Switchback Brewing Co. bottles its beer in Vermont with state-of-the-art equipment that allows the company to stay local and true to its commitment to quality. Interrobang has completed the design of a LTD. Run labeling system for Switchback's small-batch releases. The first of these is a French Saison Farmhouse Ale, available on tap and in 22oz. bottles exclusively at the Tap Room at Switchback. A three-time threedotdash mentor, Mark Sylvester has again developed the look and feel for this year's celebration gala, designing announcements, formal invitations and web materials. The 2015 Celebration Gala honored music icon and activist Chaka Khan with the We Are Family Humanitarian Award, Caryl M. Stern, President & CEO, U.S. Fund for UNICEF, with the Mattie J.T. Stepanek Peacemaker Award, and Bill McDermott, CEO of SAP, with the Visionary Award. Mark joined some of his fellow mentors at the annual We Are Family Foundation Gala Celebration Gala, held at the Hammerstein Ballroom in NYC on April 23, 2015. The We Are Family Foundation (WAFF) is a nonprofit 501(c)(3) organization founded in 2002 by legendary songwriter/musician/producer Nile Rodgers. Based on Rodgers’ world famous song, We Are Family, WAFF is dedicated to the vision of a global family by creating and supporting programs that inspire and educate the next generation about respect, understanding and cultural diversity – while striving to solve some of our biggest global problems at the same time. Lisa Sylvester has developed the logo and brand identity for South Burlington, VT-based StepAhead Innovations’ Mindstream Aquarium Monitoring System. The MindStream monitor will liberate salt and freshwater aquarium owners from the manual, time consuming, unreliable, and less accurate practices of using traditional dip test strips and liquid test kits. The MindStream monitor replaces manual intermittent testing with automated monitoring that is accurate, reliable, and stress free. Step Ahead Innovations is dedicated to developing and providing innovative aquarium monitoring products and services that enable aquarium enthusiasts to maintain healthy fish and coral ecosystems and more fully enjoy their beautiful aquatic showpieces. The company is focused on deploying advanced technologies in fluorescence indicator science, ultra-sensitive optical measurement circuits, inductive power transmission, networked cloud computing, and mobile devices to reduce the stress and hassles of owning an aquarium or KOI pond. Interrobang has completed the design of the the initial graphics for the introduction of Switchback Brewing Co.’s Connector IPA, the brewery’s first IPA. Taking its name and linear stacked filing cabinet design inspiration from the public sculpture [up the road from the brewery] entitled "File Under So. Co., Waiting for...," – a tower of eleven, four-drawer file cabinets. The sculpture is the work of Burlington, VT-based architect and artists Bren Alvarez.